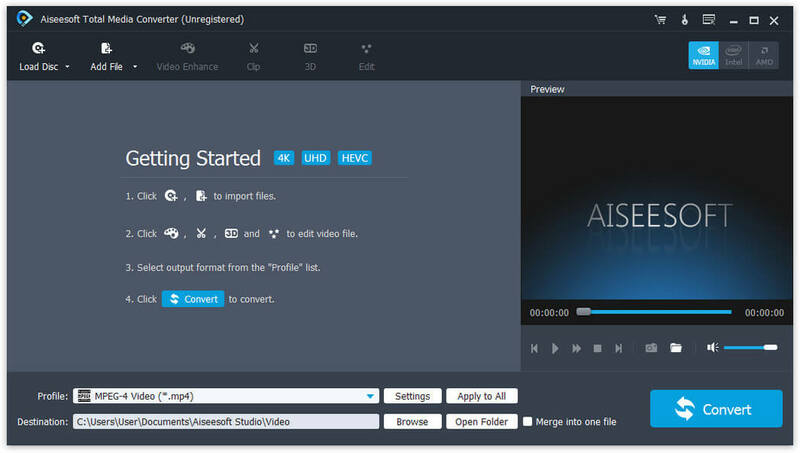 Aiseesoft Total Media Converter owns functions of homemade DVD Converter and Video Converter for multimedia users to rip any homemade DVD disc and convert popular video/audio files to any video(MPEG-4, MOV, DV, M4V, H.264/MPEG-4 AVC, AVI, DivX, XviD, ASF, WMV, MPEG-1, MPEG-2, 3GP, 3GPP, MKV, FLV, SWF, VOB, VCD, HD video) and audio(AAC, AC3, AIFF, AMR, FLAC, AU, MP3, M4V, MP2, OGG, WAV, WMA) format. Moreover, it also supports popular devices such as iPhone SE/6s/6s Plus/6, iPad mini 3/2, iPad Air 2, Microsoft Surface and Samsung Galaxy Note, etc. This software can easily convert any homemade DVD to any other video or audio formats. This Total Media Converter allows to convert any video or audio files, like HD video and AVI, MPEG, WMV, MP4, H.264/AVC, MOV, MKV, AVCHD, 3GP, etc. Put in the same source video repeatedly and set different output formats for each, you can get several output files with only one conversion. It is able to adjust like set Video Encoder, Frame Rate, Video Bitrate, Audio Encoder, Sample Rate, Channel, Audio Bitrate. For Resolution, you can input your own one. The well-customized settings can be saved as user-defined for your later use and apply to all the files.